The Sun says Mrs May delivered a "furious attack" on warring MPs, assuring voters she is on the side of the people. But the Guardian reports that the prime minister herself is facing a "furious backlash" from her own backbenchers, some of whom are now calling on her to resign. Boiling down her message to the headline "it's not my fault", the Daily Mirror describes her statement from Downing Street as a display of "deluded defiance" by an "arrogant PM". According to the Daily Mail, Mrs May abandoned plans for a long Brexit delay following warnings it would trigger a mass walkout by Eurosceptics in her cabinet. The newspaper reports that a group of ministers, known as the "pizza club plotters", held an emergency meeting on Tuesday evening to discuss their next move. Several of the ministers who were present withdrew their threats to quit, the paper says, after Mrs May announced the delay would not go beyond June. In its editorial, the Mail "applauds" her decision to speak to the public directly, over the heads of what it describes as "incompetent MPs". But, writing in the paper, the commentator Peter Oborne says her premiership is "hanging by a thread". The cartoon in the Daily Telegraph shows Mrs May appealing to President of the European Commission Jean-Claude Juncker to extend the date for Britain's exit from the EU to 30 June. The cartoonist imagines his response: "Everyone would prefer the end of May." Meanwhile, the Financial Times describes the EU as "exasperated", with the bloc's big two - France and Germany - at odds over how to handle the UK. The paper quotes one senior EU diplomat as comparing the impasse over Brexit as "a circus that is beyond comprehension". Another senior figure in Brussels tells the paper that working on Brexit with the UK is like "dealing with a failed state". In its editorial, the Times says Wednesday's ultimatum by European Council President Donald Tusk was a "humiliating reflection" of the "chaos that has engulfed British politics". And the Daily Express says that "with a quiver in her voice", Mrs May sounded "genuinely apologetic" to the people of Britain. 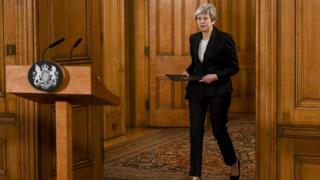 A number of the papers comment on reports that Jeremy Corbyn walked out of a crucial Brexit meeting with Mrs May and other party leaders on Wednesday - reportedly because the Labour defector, and member of The Independent Group, Chuka Umunna, was also in the room. The Guardian quotes Mr Umunna as describing the Labour leader's behaviour as "extraordinary". Meanwhile, an award-winning British composer has told the Times that the "cathartic force" of music could help heal the divisions caused by Brexit. Nitin Sawhney, who's written an alternative national anthem, says not enough artists have attempted to get to grips with our departure from the EU. The new work, which will have its television premiere next week, seeks to unpick the emotions behind patriotism. It ends on a lament for the future of the country: "This land of hope and glory, in the hands of hopeful Tories." Meanwhile, the chief executive of Prostate Cancer UK has written a letter to the Times, urging men not to follow the example of Health Secretary Matt Hancock, who claimed earlier this week that a commercial genetic test "might have saved his life". Experts have criticised Mr Hancock for wasting NHS time after he revealed he was seeing his GP because a DNA test said he could be at risk of developing prostate cancer. In her letter, Angela Culhane says predictive genetic tests are not always accurate and the charity does not recommend investing in them. A genetics professor, interviewed by the paper, said the health secretary had displayed "quite an astonishing level of ignorance" about the NHS. Under the headline, "have we made a howler with The Scream? ", the Telegraph reports that the popular interpretation of one of the most recognisable artworks in the world could actually be wrong. The British Museum, which is about to display a rare black and white version of Edvard Munch's painting, says it clearly depicts a person hearing a scream, rather than a person screaming. The curator of the exhibition says an inscription at the bottom of the image proves Munch's figure is really covering his ears as he listens to the "scream of nature" all around him. And a vicar in North Wales is appealing for his own church's bells to be silenced at night. The Times says the bells at St Mary and All Saints in Conwy mark the hour, and every quarter, night and day - keeping the vicar and his family awake. The local council has sent a questionnaire to residents, asking whether the chimes are "part of our town's character and tradition" or "annoying and unnecessary". The paper says almost all of the 200 respondents so far have opposed the vicar's proposal - with one describing the survey as "one of the most ridiculous things I've ever seen."